View of “Traversing Expanses,” 2014. The three artists in this exhibition were born in Cambodia and in refugee camps on the Thailand-Cambodia border before, during, and after the brutal reign of the Khmer Rouge in the 1970s. All three were subsequently raised abroad, and in this exhibition, as transnational artists showing in Phnom Penh, each aptly investigates the force of history and memory to unsettle a sense of self in the present. 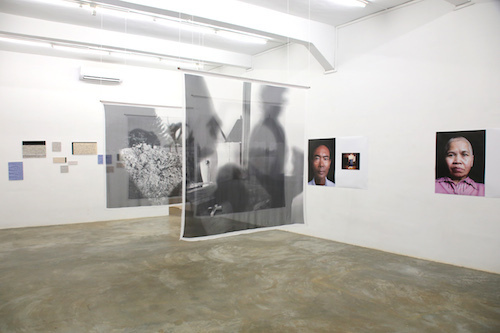 For instance, Amy Lee Sanford’s prints and video relate fragments of her father’s 1974 letters to her—he arranged her migration to the US prior to the emergence of the Khmer Rouge—in a personal, meditative process that keeps their relationship potent, despite his having disappeared in Cambodia in 1975. While her methods mitigate voyeuristic consumption by fracturing coherent narratives, the details of the letters do prove most compelling, particularly in their references to Kissinger and Vietnam. Meanwhile, Pete Pin and Seoun Som both evoke rituals that aim to shift the personal to the collective. Pin’s photographic prints are based on a relational project where he meets Khmer refugees in the US and asks each person’s family to choose a memento, which Pin then juxtaposes with portraits of the survivors. Som layers images of traditional Khmer rituals with American equivalents on sheer fabric. The featured works are rhizomatically connected to Cambodia’s histories and genealogies of international contemporary art. While debates on what constitutes the latter have yet to reach critical mass, we are here reminded of differential stakes in time, memory, and politics as well as the diverse, if not uneven, methods that can attend with these.